Carnet Customs document, issued under the terms of a convention, that permits the holder to carry or send merchandise temporarily into foreign countries ( for display, demonstration, or similar purpose) without paying duty or posting bond. Examples are ATA (Admission Temporaire) and TIR ( Transport International Routier). Violation of any of the privileges of CARNET will result in assessment of duty and charges for damage. Click here for more info. Carrier Certificate and Release Order Used to advise Customs of the shipment's details. By means of this document, the carrier certifies that the firm or individual named in the certificate is the owner or consignee of the cargo. CBM Cubic Meter (35.314 cubic Feet = 1 CBM). Certificate of Origin The document certifies that goods were manufactured in the United States. It is signed by the shipper and may also be a certified by a local Chamber of Commerce, notarized, and even visaed by a resident foreign consul. A Certificate of Origin may be required by a foreign government for control purposes, or by the foreign importer to ensure that he receives U.S. goods. Specific C/Os are required for duty reductions with Canada (U.S./Canada Free Trade Agreement) and Israel (U.S./Israel Free trade Area). CFS/CFS Container Freight Station to Container Freight Station. A type of steamship line service in which cargo is transported between container freight stations, where containers may be stuffed, stripped, or consolidated. Usually used for less-than-container load shipments. Chargeable Weight The shipment weight used in determining air freight charges. The chargeable weight may be the dimensional weight or for container shipments, the gross weight of the shipment less the tare weight of the container. Charterparty A Charterparty is a contract signed between a ship owner and a charter who hires the vessel for a period of time (Time Charter) or for a particular voyage (Voyage Charter). There are many types of Charterparties, most codified by various shipping associations. Clean On-Board B/L A Bill of Lading issued without exceptions. COD Collect on Delivery: cost of goods and freight. Collect Freight Freight payable to the carrier at the port of discharge or ultimate destination. The consignee need not pay if the cargo does not arrive at destination. Collection Lletter A collection is the procedure whereby the exporter entrusts the movement of his commercial documents to a remitting bank for further processing through a collection bank for settlement from the buyer. A Collection Letter is the document used by the remitting bank to relay complete and precise instructions to the collecting bank. Commercial Invoice A commercial invoice is the basic statement of the seller to the buyer for payment of the goods shipped. It must conform to any Letter of Credit requirements, foreign government requirements, and U.S. export control requirements regarding destination statements. It is used as one of the primary documents in the collection process, and is the main document used by foreign Customs for control, valuation of the goods, pricing, terms of sale, payment and delivery, credit numbers, import license numbers, shipper and consignee names, and shipping marks and numbers. 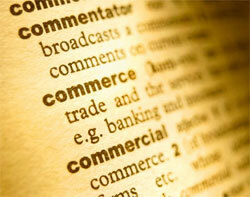 Commercial invoices are usually signed by the exporter. Commercial Value Assessment of monetary value of manufactured goods including production costs, packaging, shipping, overhead and profit margin; used to determine duty. Commodity Control List List of commodities subject to U.S. Department of Commerce export controls. Commodity Any article or goods of commerce. Conference Rates Published rates which are applied equally by all the lines belonging to that particular conference for a specific commodity. Consignee The receiver of the shipment. Consular Invoice Prepared from the information on the commercial invoice by the buyer's consulate or embassy in the shipper's country, these documents are usually stamped with an official seal. They may be specific forms required by the destination country's government or simply copies of the Commercial Invoice. Consular Invoices are required for control of certain commodities and to ensure valuation control. Consularizaiton A document certified by the Consular of some foreign countries verifying the value, quantity and nature of a shipment. Country of Transshipment The country through which a shipment must pass and be re-sorted to reach its ultimate destination. Country of Ultimate Destination Final country, as known by an exporter, where goods are scheduled to arrive. Courier A term used to connote fast, expedited, personalized package and document handling. Customs Broker A firm that represents importers in dealings with Customs. Normally responsible for obtaining and submitting all documents for clearing merchandise through Customs, arranging inland transport, and paying all charges related to these functions. Customs Clearance International procedure of declaring goods at the Customs Office to gain authorized entry of those goods into a country. Customs Invoice Certain countries require special invoices containing specific information for the Customs clearance and valuation of imported shipments. These documents contain most of the elements of the Commercial Invoice, and are usually in the language of the importing country. The Canadian Customs Invoice is the most popular of this type. Customs Value The value of a shipment as declared by the shipper or appraised by Customs to enable determination of accurate import duties. Container Yard to Container Yard. A type of steamship line service in which freight is transported from origin container yard to destination container yard. Dangerous Goods Articles or substances which are capable of posing a significant risk to health, safety or property when transported by air and which are classified according to subsections 3.1 through 2.10 in IATA. This includes cargo labeled as flammable, corrosive, radioactive, etc. Declared Value The value of a shipment as declared by the shipper, used to determine the value for duty and carrier liability. Delivery Instructions Also called delivery Orders, these documents provide specific information to a carrier regarding delivery to a specific port, pier, terminal, airport, or steamship line. They show the shipping carrier, delivery deadlines, name and address of consignee, and the contact name and telephone number of the shipper n case of delivery problems. Delivery Order Document issued by the Customs broker to the ocean carrier as authority to release the cargo to the inland carrier. Delivery Service Bringing goods to a destination on behalf of a shipper for a fee. Demurrage A charge for storage of incoming merchandise beyond the free time allotted by the shipping company. Also applies to carrier owned or leased equipment, such as containers and chassis. Destination The location to which a shipment is being delivered. Dimensional Weight The weight calculated by measuring the length x width x height of a package: used when calculating the rate of oversized pieces. Dock Receipt The Dock Receipt provides the exporter with a receipt indicating that the ocean terminal operator has taken custody of the shipment on behalf of the ocean carrier. It is basically a proof of delivery of the goods from the exporter to the pier. Draft Sometimes called a Bank Drafter Bill of Exchange, the Draft is a negotiable instrument which contains an order to pay. It must be signed by the drawer (seller) and be payable at sight or by a certain time. The Draft must contain an unconditional order to pay a certain sum of money to the drawee (buyer). Drafts are used in both collection and Letter of Credit methods of payment. Dutiable Those goods which are subject to duty as per each nation's Customs regulation. Duty Drawback A refund of duty paid on imported merchandise when it is later exported. Duty A tax imposed by a government on merchandise imported from another country. There are several types of duty, including: A) Ad valorem duty ("According to the value") - an assessment based on of the actual value of an article. B) Specific duty - an assessment based on the weight or quantity of an article without reference to its monetary value or market price.